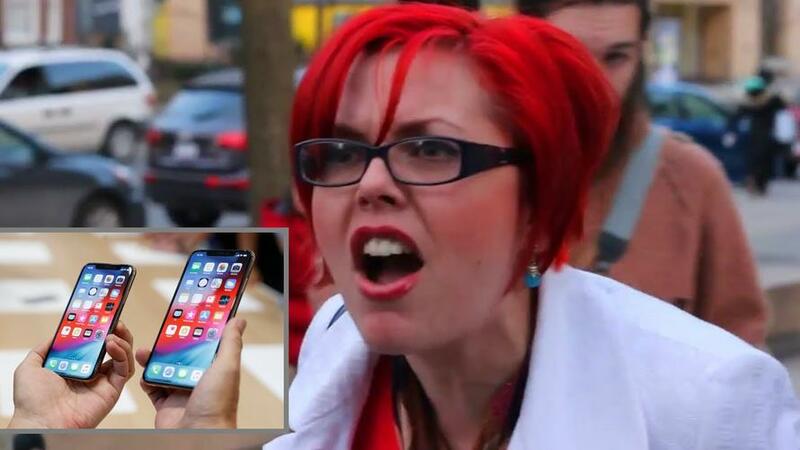 Feminists are spitting mad after Apple sexistly created an iPhone that was too large for tiny female hands, which are one inch smaller than the average man's hand according to a 2015 study. Lodging complaints against the new iPhone XS which surely won't diminish cases of actual sexism, women such as University of North Carolina professor Zeynep Tufecki tweeted: "Women like me with small hands who need the most secure phone for safety reasons are stuck with something they can’t hold and constantly risk dropping." UK journalist Caroline Criado Perez also bemoaned the giant phones - telling The Telegraph that she incurred a repetitive strain injury after using the iPhone six, with its 4.7" wide screen, because it was simply too large. Her symptoms abated when she switched to the smaller, daintier iPhone SE with its 4" screen. "I have to make a choice between making an upgrade to the only phone that fits my hand before they discontinue it — soon there will be no iPhone that fits the average woman’s hand size — even though the technology is two years out of date," Criado Perez said. Also irking women is the fact that iPhones are way too big for women's pockets. An August survey by culture website The Pudding found that the iPhone X - at 5.8 inches, won't fit 60% of the 20 most popular women's denim jeans. Clearly there is sexist and bigoted collusion going on between Apple and major clothing manufacturers to prevent women, and possibly midgets, and maybe children, from enjoying the latest in iPhone technology.